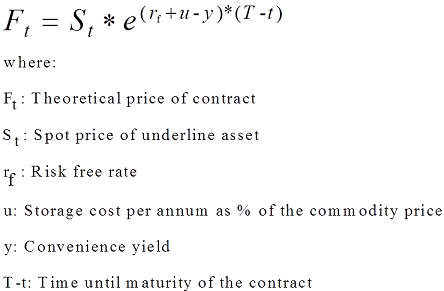 Theoretical or fair value is a mathematical estimation of the price that a particular future contract should have. We know that futures prices aren’t coincide with spot prices before the expiration of a contract. This discrepancy is due to the basis. The theoretical value is trying to estimate the magnitude of the basis by taking into consideration all the factors (i.e. storage cost, interest rates and more) that make the price of a contract to be different from the spot price. Depending on the underline asset a different formula can be applied. For example if we want to price a commodity future we have to take into consideration the storage cost, whereas a stock index future (i.e. S&P 500) does not have storage cost but it has dividends. Below we can see the formula by which we can estimate the theoretical value of a commodity future which can be held for consumption. The symbol e denotes the natural logarithm and it is used in order to incorporate in the formula the concept of continuous compounding. Notice that the future price is positively related to interest rates and storage cost (positive signs) and negatively related to the convenience yield (negative sign), as mentioned in the relative page. This means that as the interest rates and the storage costs are getting higher the higher will be the price of the future relatively to the spot price. This happens because in the case of interest rates the money that someone has to borrow in order to hold the real asset is more expensive and he/she will be better off if they have opened a long position in futures where the money borrowed will be less due to leverage. Also if the storage cost is high then it would be better for someone not to hold the real asset in order to avoid this cost. Instead he/she can buy futures contracts and the higher demand will augment their prices. 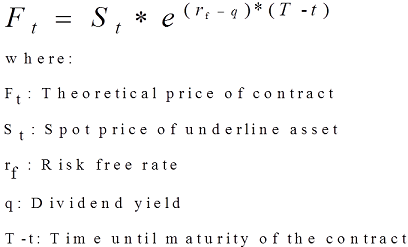 Below we can see the formula by which we can estimate the theoretical value of an index future. Notice that dividend yield is negatively related to futures prices. This is happening because the higher the dividend yield the more an investor/trader is benefited from the dividends received by holding the underline asset instead of a future contract that doesn’t provide its holder with dividends.